As the puck dropped, students from each high school flooded the stands and chanted for their teams. Brentwood exploded offensively from the start of the game, and scored quickly with an unassisted goal by Benjamin Wallace only 4:48 into the game. As the second period started, Brentwood continued to control the game offensively, despite Ravenwood winning the shots on goal battle in the first period nine to five. At 12:26 left on the clock, Brentwood increased their lead by one with a goal by Ryan Coliano and was assisted by Nathaniel Biron and Jacob Layne. Very soon after, Nathaniel Biron was called on a slashing at 11:44. 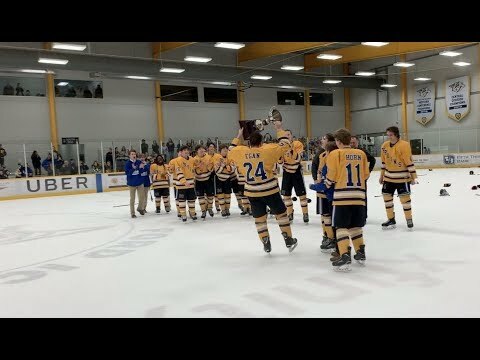 Ravenwood tried to set up their power play and get back into the game, but Brentwood continued to kill the penalty, which was a reoccuring theme with Ravenwood being 0/3 on the powerplay. Brentwood’s great defense on the penalty kill lead to a great individual effort by Jacob Layne. He gained possession behind the net and sneaked the puck past the goalie for a shorthanded goal at 9:57 and earned his second point of the game. Brentwood went on to score one more goal by Hudson Nadasdi assisted by Wallace and Egan making the game 4-0 with 6:36 left in the second period. This made Ravenwood substitute their starting goalie Aiden Vanston for Logan Verpoort for the remainder of the game. Even though Verpoort made some excellent saves, it was not enough against the Bruins fast paced offense. Brentwood went into the third period and scored three more goals by Sean Egan, again Hudson Nadasdi, and Benjamin Biron. The Brentwood Bruins goalie Ryan Bobrow displayed a great shutout stopping 21 shots on goal. Combined with the offense and six different goal scorers, Brentwood won 7-0 and hopes to continue this type of play into their next game on Oct. 1st at 7:00 p.m. against Montgomery Bell Academy. On the other hand, the Ravenwood Raptors hope to move on from this performance and look to prepare for their next game. Benjamin was born in Nashville, Tennessee and grew up in the outskirts of the Nashville area. His love for hockey began when his parents took him to his first Nashville Predators game when he was a young child. Ever since then, Benjamin has continued to go to as many Predators games as possible and has obtained a passion for hockey. He currently is studying communications with a concentration in journalism and news editorial at Tennessee Tech University. After graduation, he hopes to pursue a profession in sports journalism. Whenever Benjamin is not watching hockey, he usually is hanging out with friends, playing video games, skateboarding, working at a movie theatre, or interning with the marketing and promotions coordinator for Tennessee Tech’s athletic department.